The owner of a classic car restoration business destroyed by a fire at a nearby fireworks factory says a unique vehicle has gone. The 1956 Studebaker gold hawk was destroyed in the blaze at Firemagic, near Clevedon, on Friday. Three people were taken to hospital after the fire. Keith Birch, director of Bristol Classic and Sports Cars, said: "We've destroyed people's trust - through no fault of our own." He added: "My main concern is that five people depend on this place for a living." 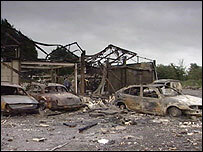 Several Mark 2 Jaguars, a Daimler V8 and a Jaguar XK150 were also lost in the fire. Two containers of fireworks exploded on Friday evening, with two nearby houses also affected. 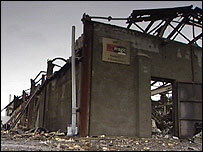 One eye-witness, Nick Stokes, told the BBC: "You could see the fire from the M5 as you come over the crest from Portishead. "There was a massive fireworks 'display' for about 40 minutes of constant bangs. "We counted eight to ten police cars, four fire engines, an ambulance and various unmarked emergency vehicles."